I thought I would share with you some of the gorgeous chocolate cupcakes that Helen and I have made . Some of the icing flower work is intricate and detailed, but some is very easy and can be made with flower cutters and moulds. 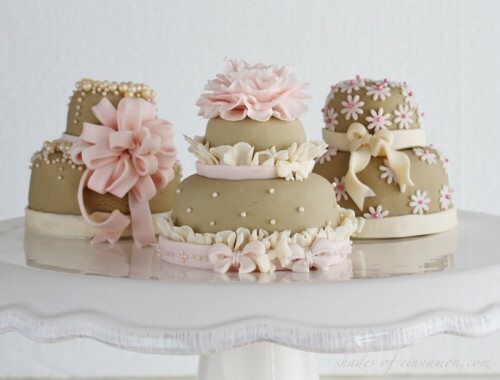 If you live in South Africa, a great source for cake decorating equipment is Lollodoo in Cape Town, and they will deliver around the country. They stock the latest trends in cake decoarting, stock moulds, cookie cutters, designed acrylic rolling pins, patchwork cutters, and cake pop moulds. Have a look at this great tutorial by Peggy Weaver on how to make and roll fondant icing, Marshmallow Fondant Icing recipe and Tutorial . You can always buy the fondant ready made but it doesn’t taste as nice as the marshmallow fondant. For making small flowers, the store bought version is perfect. 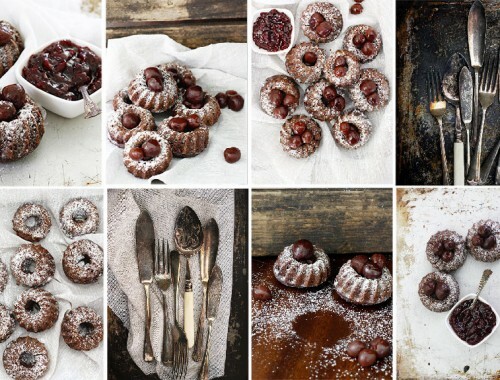 And if you are feeling adventurous try out the beautiful Unwired Anemone Tutorial by Tasha’s Tasty Treats. But be warned, you will need a lot of time and patience to master these babies. Helen has perfected the beautiful cameo’s below , which are made from a mould which I bought in Paris. What a find, in an amazing cake decorating shop situated in the industrial food catering area of Paris. Unfortunately I never took the name of the shop and will probably never find it again. 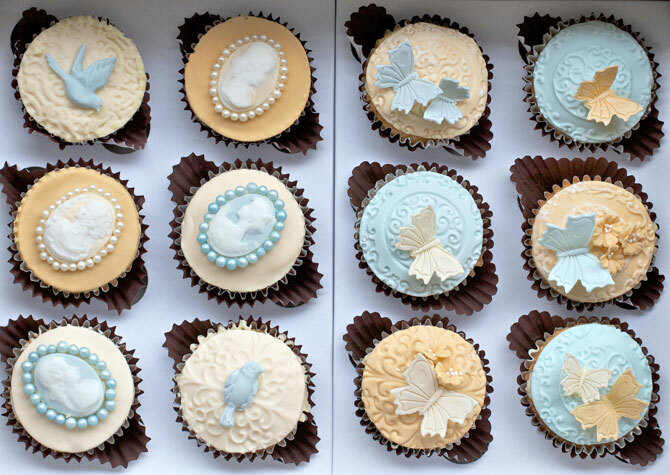 Pressed design moulds or rollers can be used for the damask and filigree work on the fondant. 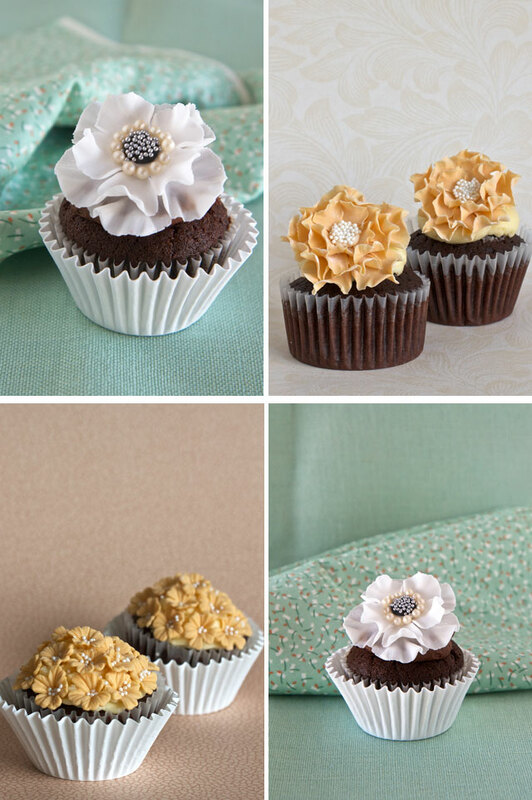 The little flower cupcakes below are super easy to make using blossom sugar art cutters. All you need is a little time to make hundreds of them. The more you add to the cupcake the better. Happy decorating !!!! Line silicone cupcake moulds with paper cupcake cases. Combine broken chocolate, cocoa powder and water in a saucepan and heat of low heat until the chocolate has melted and is smooth. Transfer the mixture to a bowl and allow to cool for 15minutes. To this mixture add the butter, sugar, eggs, vanilla essence, sour cream and sifted dry ingredients and beat on low speed with an electric mixer until combined. Increase speed to medium and beat for 3 minutes or until the mixture is smooth and lighter in colour. Pour 80ml (1/3cup) into each cupcake case. This will make 12 cupcakes. Beat the butter in a small bowl with an electric mixer until the butter goes as white as possible. Beat in half the sifted icing sugar, then the milk and then the remaining sifted icing sugar. If you are making chocolate buttercream sift ⅓ cup (35g) cocoa powder in with the icing sugar before mixing into the butter. HI Ev! 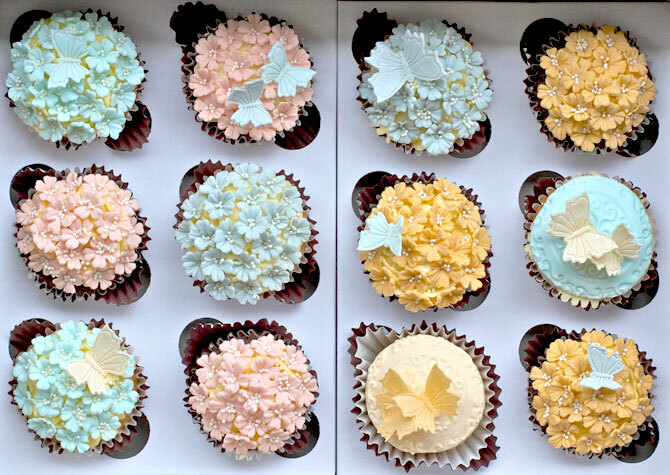 I stumbled upon your blog while I’m searching for dessert recipes for a client, and I can’t help but to say you’re cupcakes are so beautiful! The colors and the designs blend so wonderfully! 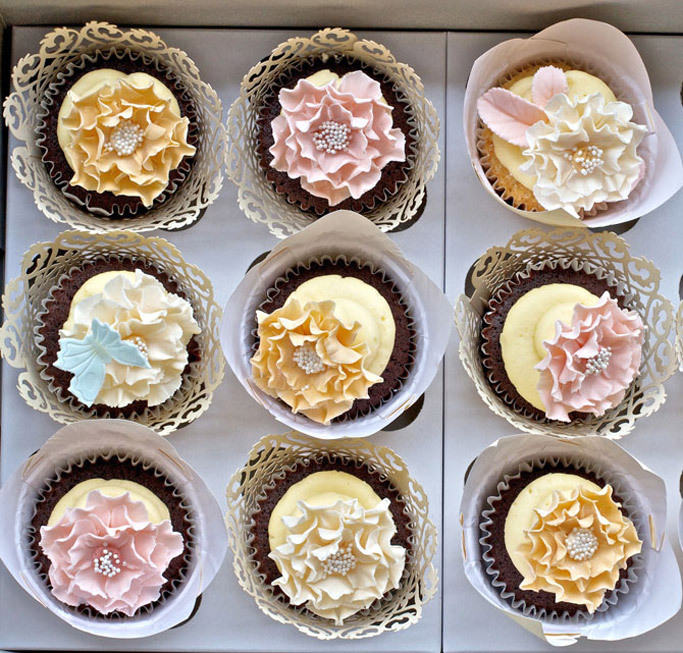 Sophisticated cupcakes, they are, too! Admiration, great idea, great job! Trust you are well? . Was hoping you could advise where I couldve gone wrong when making those divine looking chocolate cup cakes I found on your blog. Made a batch last week that turned out disastrous tasted great though! Hubby was happy he did not have to wait for Christmas for trifle! They looked perfect when I had peak but as soon I took them out of the oven they sunk. Followed the recipe to the t. Would be happy for your comments. Im so sorry they were a flop. It happens sometimes with cooking – I have made these so many times, so I know the recipe is 100% correct. Â Just double checked each ingredient on my post. Reasons why your cupcakes may flop. 1. There is no baking powder in this recipe but check that your self raising flour or baking soda has not expired. Â It seems such a trivial thing but sometimes that is the cause. 2. Overbeating is the most common reason why cakes sink. Sometimes your beater is stronger than others. Beat this until it is just smooth. If you like you could try beating in the eggs, butter and other wet ingredients first and then folding in the flour gently, although I never do that in this recipe. Make sure that your butter is soft – was it soft? 3. Did you leave your melted chocolate to cool for 15mins? 4. 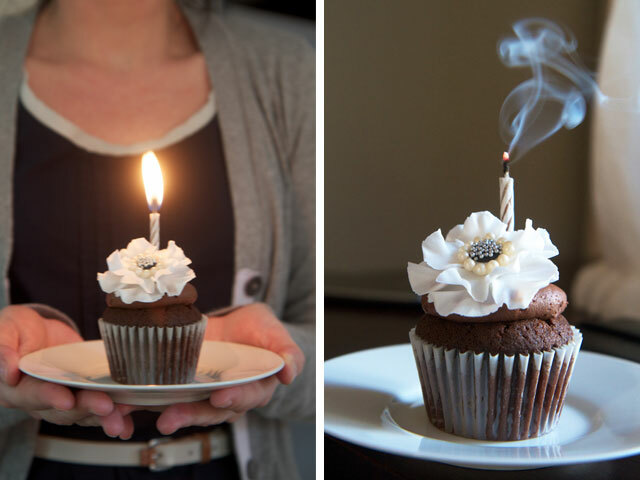 Make sure your oven has heated completely before putting the cupcakes in . This is a very low oven 160 so it needs to have reached that before putting the cakes in. Check the centre of the cupcakes after 30minutes, if the skewer comes out wet leave it in for a further 5 to 10 minutes. Dont be tempted to open the oven earlier, this can also cause them to sink. 5. The last thing is that baking powder and baking soda are not interchangeable. Did you use baking soda? Baking soda works along with an acid like buttermilk, lemon juice and yoghurt whereas baking powder, although containing a little baking soda has other components that act as a catalyst to raise the cake, but it is used in recipes that don’t have acidic elements. Yes, you are absolutely right, the self-raising and baking soda being the reason, ( I should know that by now -freshness is crucial) used the last of the SR and the B soda is almost finished! In hindsight, I have often steered away from recipes that call for Self raising flour. Have found cakes never seem to rise as nicely when using flour and BP. And I fully agree with you about not interchanging raising agents. Secondly, oven temperature, and I must have opened the oven door a little too early. Certainly going to give these beauties another try. 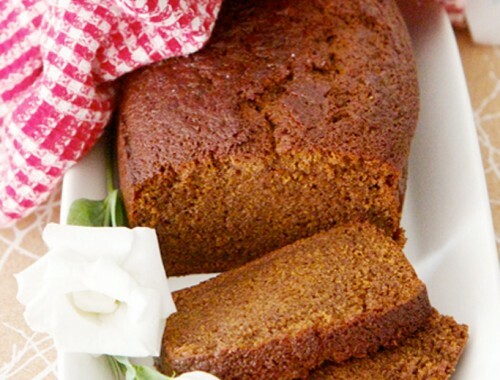 Just loved the texture and the divine “chocolatey” flavour like no other recipe I have tried – and yes so very moist.